Stony Brook, NY, March 15, 2013 - Last Summer and Fall, New York State Office of Parks, Recreation and Historic Preservation (NYS OPRHP) and the Long Island Sound Study (LISS) held four volunteer events around the Sound at recreational and ecological important LISS-designated Stewardship Areas. 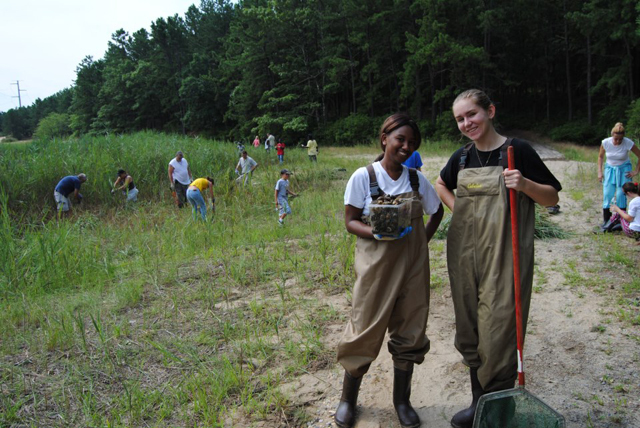 The volunteer events - organized by Ariana Newell, a biologist for NYS OPRHP, and Larissa Graham, NYSG's former Long Island Sound Study Outreach Coordinator - helped improve the ecological conditions at these Areas. Activities included invasive plant pulls and invasive snail removal at Sunken Meadow State Park and Brookhaven State Park, native tree planting at Orient Point State Park, and native seed collection at Caumsett State Park and Preserve. In total, more than 50 volunteers participated in these events. Volunteers came out to Brookhaven State Park on Saturday, August 11, 2012 to remove Phragmites and collect invasive Chinese mystery snails. Photo courtesy of Long Island Sound Study. They were all wise to wear their long pants and rubber boots, and come equipped with work gloves, sunscreen and bug spray. 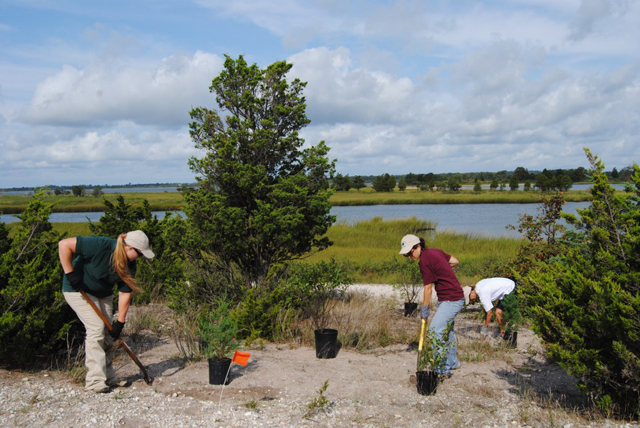 During a beautiful early-September 2012 day at Orient Beach State Park, Stewardship Day volunteers planted more than 30 native shrub by the water. These shrubs will provide erosion control for the area and habitat for wildlife. Photo courtesy of Long Island Sound Study. On Saturday, October 13, 2012, volunteers participated in a Stewardship Day at Caumsett State Historic Park Preserve in Lloyd Neck, NY. 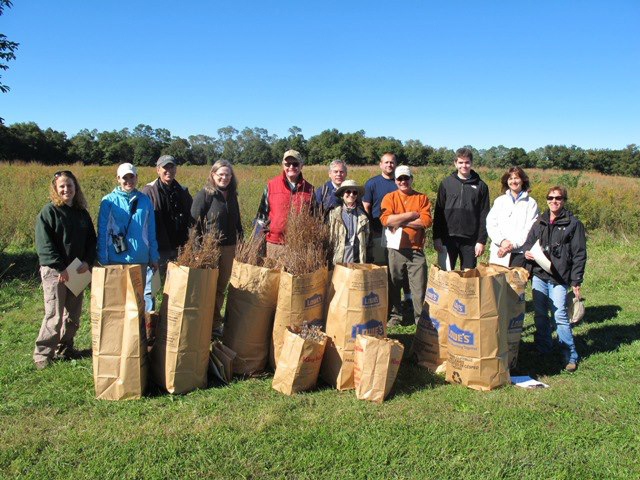 Nearly 20 volunteers collected eight lawn bags full of seed from four types of native plants: big bluestem, milkweed, goldenrod, and black-eyed susan. The seeds that were collected will be used in a Long Island Sound Futures Fund habitat restoration project to restore native grasslands at Caumsett State Historic Park Preserve, as well as other restoration projects in the park and on Long Island. Grasslands provide critical habitat to many species of birds, butterflies, and other wildlife and this type of habitat is rapidly disappearing on Long Island due to development and ecological succession. Photo by Larissa Graham. For more on what you can do to make a difference, click over to the "Get Involved" or "Stewardship" sections of the Long Island Sound Study's Web site. News on the Long Island Sound Study can also be found in New York Sea Grant's related archives. If you would like to receive Long Island Sound Study's newsletter, please visit their site's homepage and sign up for the "e-news/print newsletter" under the "Stay Connected" box. For daily updates and tips on how you can help protect and restore Long Island Sound, please join LISS on Facebook or, sign up for their RSS feeds. For more information on New York State Office of Parks, Recreation and Historic Preservation, visit nysparks.com/parks. Long Island Sound is one of the 28 nationally-designated estuaries under the NEP, which was established by Congress in 1987 to improve the quality of Long Island Sound and other places where rivers meet the sea. The Long Island Sound Study, conducted under the Environmental Protection Agency’s (EPA) National Estuary Program (NEP), is a cooperative effort between the EPA and the states of Connecticut and New York to restore and protect the Sound and its ecosystems.